Let me use my devices, will you? In 2012, Apple introduced AirDrop for Mac OSX and with iOS, brought it to iOS, too. Unfortunately, AirDrop != AirDrop and you cannot use both together. While sending something from one iOS device to the other, and from one Mac to another, you cannot send a photo from your iPhone to your Mac. Because AirDrop for iOS is compatible with AirDrop for OSX. Mind you, this incompatibility is most likely not due to technical issues, but rather a product decision Apple took. Why? The heck I don’t know. Since the emergence of computers in your trouser pockets, we started to increasingly see usage patterns where one user would use more than one device at a time. Well, not AT THE SAME time, but near enough. Working on your notebook to quickly switch to your phone to take a photo of the mind map your team created that you want to include in the document you are working on. Stuff like this. There is many more of these patterns out there, and they include the whole lot of computerized gadgets that make up our surroundings. So why, why, can I not send a photo from my phone to my notebook? What is the reason for Apple taking the decision to restrict multi device usage in this way? If you want to stay wihtin your own personal space: use iCloud. 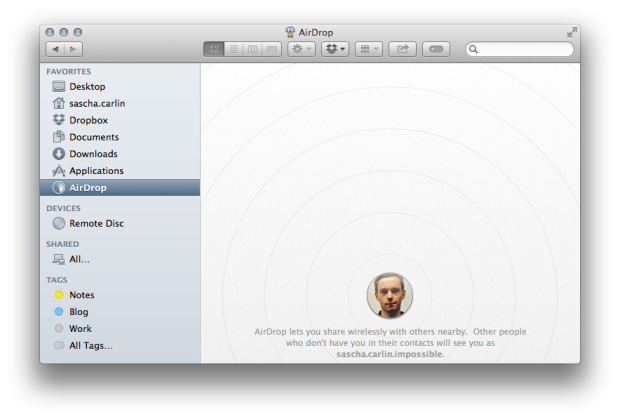 If you want to share something between you and others within the same context: use AirDrop. If you want to share something between you and others in other contexts: seen as security risk. Maybe they work on something here? Hmm. That does make sense, but does not answer the question. You have an image on your phone, that you want to send to me. Why bother with Mail or iMessage, when you could AirDrop it? Continuity and AirDrop in iOS 8 together with Mac OSX 10.10 Yosemite will provide a much better experience when using your iOS devices with a Mac.